1. 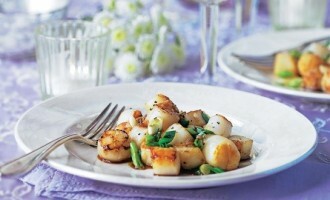 Heat the oil in a large frying pan and add the scallops, sliced spring onions and grated ginger. Cook over a medium heat, turning over the scallops occasionally, for about 2 minutes. 2. Add the garlic and cook for another minute or until the scallops are just cooked. Remove from the pan and set aside. 3. Add the sherry, soy sauce and honey to the pan, and simmer until reduced by half. Pour over the scallops and serve.